Simply put, the Denny Substation is one of a kind. It is unusual both in its design and in its location in a dense urban neighborhood. The final design represents two years of work by City Light and its design team, and reflects the input of area stakeholders and the guidance of the Seattle Design Commission. It meets the functional need of supporting and serving the expansion and growth of the area and the aspirational goal of being a community asset. View the Denny Substation gallery to see more images of the substation. Though the majority of the site will be utilized for substation operations, the design reflects community priorities such as open space and sustainability. The design includes over 44,000 square feet of open space, on-site solar power, a heat recovery system to provide 100% of the required heating for many facilities within the substation, and manyother sustainability features. The sustainability elements reinforce City Light's commitment to environmental stewardship and energy conservation. This unique design includes public benefits that will encourage a safe and active pedestrian environment. The substation design features sloped enclosure walls that decrease the size of the facility at the pedestrian level, creating a friendlier urban environment along the edges. The sloped walls include metal cladding and translucent glass panels that will emit a soft glow at night. 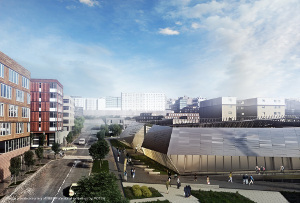 Additionally, as part of the terracing, an "elevated interpretative pedestrian walkway" wraps the Denny Way edge and continues north along the alley. This elevated zone will be fully accessible with gentle slopes to allow for views into the substation as well as Denny Way and the cityscape. The substation is open in its design (without a roof), although most of the substation equipment will be hidden from public view within buildings. Other public benefits include places for gathering, an off-leash area, public open space along Minor Avenue N and John Street, an event zone, alley improvements, and a community space for events, meetings and lectures. The following equipment will be housed inside the Denny Substation. The majority of the substation equipment will be housed in enclosed structures only accessible by City Light personnel and technicians.